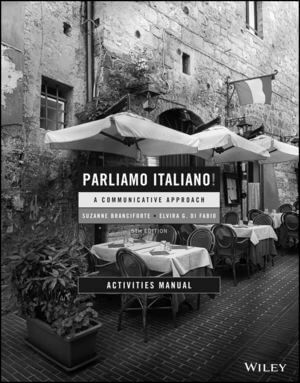 This is the Activities to accompany Parliamo italiano!, Edition 5. Parliamo italiano!, Edition 5 continues to offer a communicative, culture based approach for beginning students of Italian. Not only does Parliamo Italiano provide students learning Italian with a strong ground in the four ACTFL skills: reading, writing, speaking, and listening, but it also emphasizes cultural fluency. The text follows a more visual approach by integrating maps, photos, regalia, and cultural notes that offer a vibrant image of Italy. The chapters are organized around functions and activities. Cultural information has been updated to make the material more relevant. In addition, discussions on functional communications give readers early success in the language and encourage them to use it in practical situations. Suzanne Branciforte is a wine communicator who works with prestigious Italian wineries in regions throughout Italy. She is a Food & Wine blogger and created the Italian Grapevine, a blog for Italophiles, foodies, and wine-lovers everywhere. She graduated from Harvard and got her MA and PhD from UCLA. 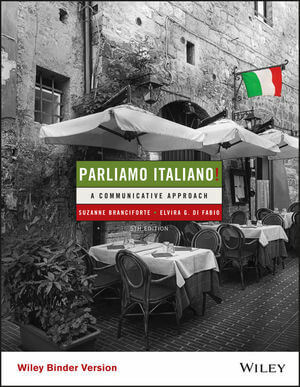 Author of the best-selling Italian language program Parliamo italiano! (John Wiley & Sons, 5th edition), she is the founder of the school Study in Italy with branches in Siena and Genoa.